In the last session of the day, we had a few experimental talks on noticing how food changes physical condition. It was also an interesting series of talks that shows the importance of collecting our own subjective data to back up or refute the other technological data that we might also have access to. 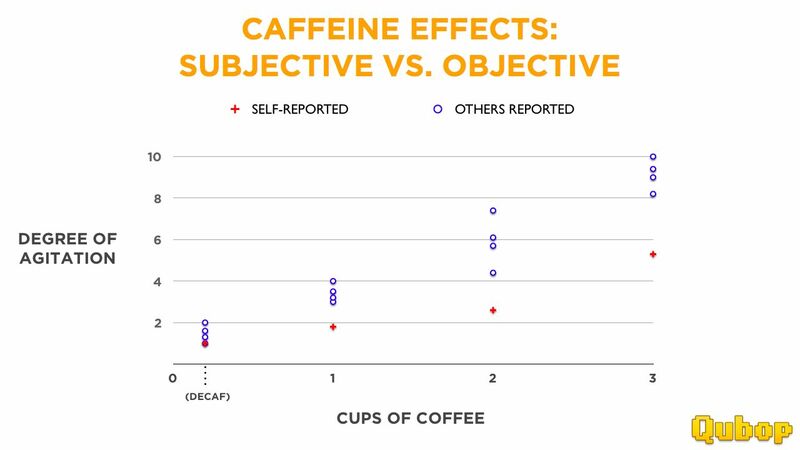 I kicked off the session with my talk “Quantifying My Genetics: Why I have been banned from caffeine”. My colleagues and friends helped me quantify my behavior after one, two, or three cups of coffee by giving my agitation a number from 0-10. I found out that I’m a slow caffeine metabolizer from my genetic results and it seems like there is a correlation between how caffeine affects me and my genes. My genes are not deterministic, I couldn’t have known how caffeine affects me without making my own independent observations. On a fun note, the crowd guessed that I had one cup of caffeine today, they were right, I had a cup of tea earlier down in the restaurant, away from the conference. Next we had Martha Rotter who talked about how she experimented with her diet to solve her skin problems after doctors told her there was not much she could do. She did one allergy test where the results said she was allergic to chicken and soy- but after cutting out both of those foods, she did not see any changes but it gave her the idea to test different food groups. After her experiment with a chicken and soy-less diet, she tried a few other food groups, eventually hitting on cutting out dairy. Her skin cleared up within two weeks of stopping drinking milk, eating cheese. I think the take away message from our two sessions this afternoon, don’t be afraid to do your own testing, trust in your results.